An abandoned rail line in the center of Columbia, South Carolina serves as the site for this, a class wide submission to the AIA Columbia design competition. Formerly, the rail line served as a passenger thoroughfare for affluent New Yorkers to winter in Florida, now abandoned the centerpiece of the site is a 500’ long abandoned tunnel that was to be renovated to become an integrated part of the city. 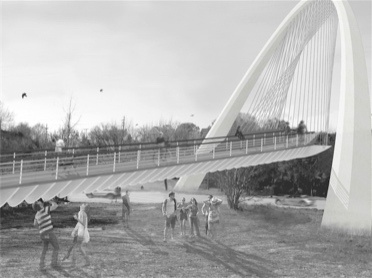 The class proposal allows this tunnel to serve to connect two disparate parts of the city, the newly renovated arts district of the Vista and an area cut off from the rest of the city by traffic, Finlay Park, the largest park in Columbia. A collaborative effort from the start, the project was divided into four constituent parts and tackled in parts. 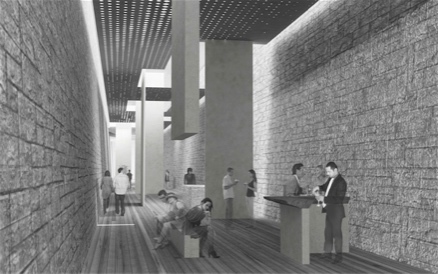 Focused around the circulation of groups of individuals through a fluid park space and the reutilizing of the abandoned train tunnel, a hidden jewel buried with the center of the city. The project embraces the ideas of connectivity and redevelopment central to the competitions directives and those expressed by the city at large. Utilizing a wide range of media throughout the process a rich complement of presentation materials were created throughout with a focused emphasis on physical modeling. An environment of experimentation was utilized to push the students skills but also for them to explore design through the use of 2D & 3D diagrams, hand drawings, drafting, three-dimensional modeling and visualization.